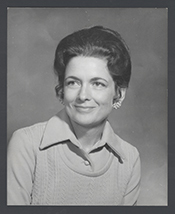 LLOYD, Marilyn Laird, (served under the name of Marilyn Lloyd Bouquard in the Ninety-sixth through Ninety-eighth Congresses), a Representative from Tennessee; born Rachael Marilyn Laird in Fort Smith, Sebastian County, Ark., January 3, 1929; graduated from Western Kentucky College High School, Bowling Green, 1945; attended University of Alabama, Selma, Ala.; attended Shorter College, Rome, Ga., 1960; owned and operated radio station WTTI,, Dalton, Ga.; owned and operated Executive Aviation, Winchester, Tenn.; elected as a Democrat to the Ninety-fourth and to the nine succeeding Congresses (January 3, 1975-January 3, 1995); not a candidate for reelection to the One Hundred Fourth Congress in 1994; died on September 19, 2018, in Chattanooga, Tenn.
Marilyn Lloyd in Women in Congress, 1917-2006. Prepared under the direction of the Committee on House Administration by the Office of History & Preservation, U. S. House of Representatives. Washington: Government Printing Office, 2006.